Chemtex - OILM9503 - Specialty Products - Poly Sheeting and Poly Liners - Poly Sheeting, 6 Mil, Clear by Chemtex, Inc.
Poly Sheeting, 6 mil Thickness, 40 ft Width, 100 ft Length, Polyethylene, Clear. Covers warehouse equipment, machinery, construction materials and skids. Replaces expensive drop cloths. Giant sheeting ideal cover for lumber, walls and scaffolding. 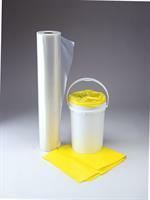 No reviews were found for Chemtex - Model OILM9503 - Poly Sheeting, 6 Mil, Clear. Be the first to review!